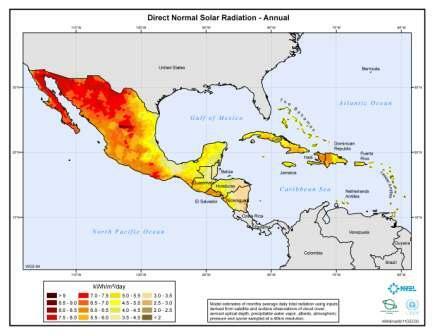 A few months back I did a post on what wind and solar power potential maps for the Latin America and the Caribbean (LAC) countries could be found on the internet, and promised updates on others as I found them. Well, it might take me awhile to do so, but I usually do come through with the promised follow-up (eventually!). Except where otherwise noted, most of these were produced by the US National Renewable Energy Laboratory (NREL) and the Solar and Wind Energy Resource Assessment (SWERA) project sponsored by UN Environment Programme’s (UNEP) and the Global Environment Facility (GEF). I remained surprised (if not discouraged) by the lack of country-focussed wind and solar maps for Caribbean states other than Cuba and the Dominican Republic, or for that matter, Belize or Panama. Have none of these nations sought to have these done, or do they consider them state secrets? As I find more such maps and/or updates of these types of maps, I’ll post their information. Likewise I invite people to alert me to other such resources — I’ll share the information here. 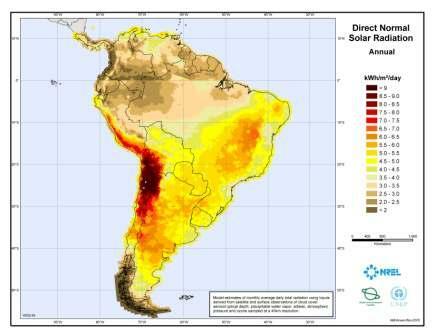 Solar Potential Maps. SWERA now provides both overview maps of annual averages for direct normal solar radiation and global horizontal solar radiation for the entire continent (click thumbnails to enlarge) in PDF form on their website. 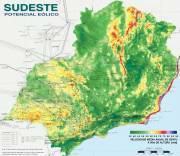 Solar Potential Maps. 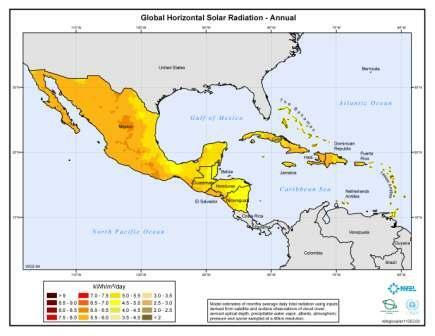 SWERA now provides regional overview maps of annual averages for direct normal solar radiation, global horizontal radiation and flat plate collector tilted at latitude covering Mexico, Central America and the Caribbean islands (click thumbnails to enlarge) in PDF form on their website. 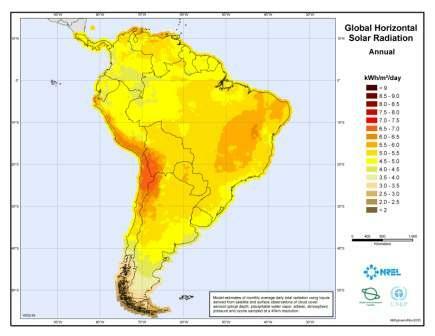 Solar Potential Maps. 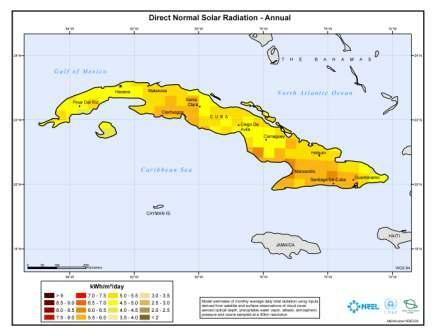 Cuba’s (somewhat sketchy) solar maps are now posted at SWERA in PDF form. These include both average annual and monthly average series for direct solar radiation, as well as average annual and monthly average for global horizontal solar radiation (click thumbnails to enlarge). Also provided are solar potential annual average and monthly average maps for flat plate collectors tilted at latitude. Wind Potential Maps. Also now on SWERA is a zip file containing three PDFs of onshore and offshore wind power density (W/m3) potential maps at 50 meters height for Cuba: one plain, one topographical and a third noting key places (Havana, Cienfuegos, Santiago, etc.). Other. 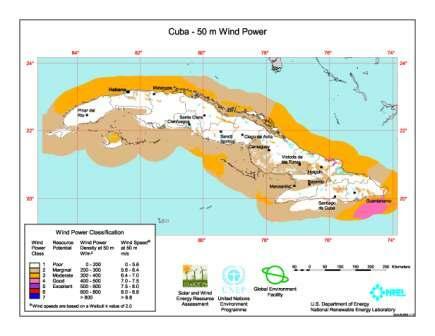 SWERA’s combined interactive version of the solar and wind maps for Cuba is also now activated. 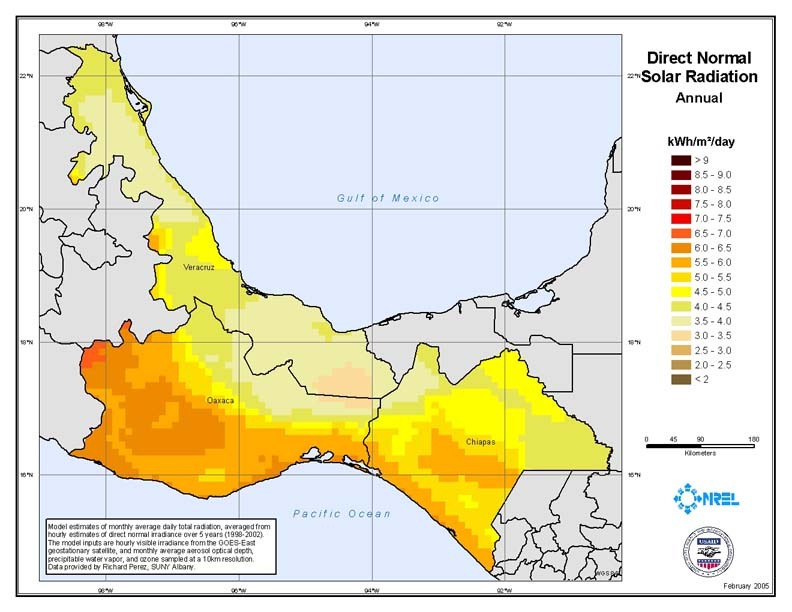 Solar Potential Maps. 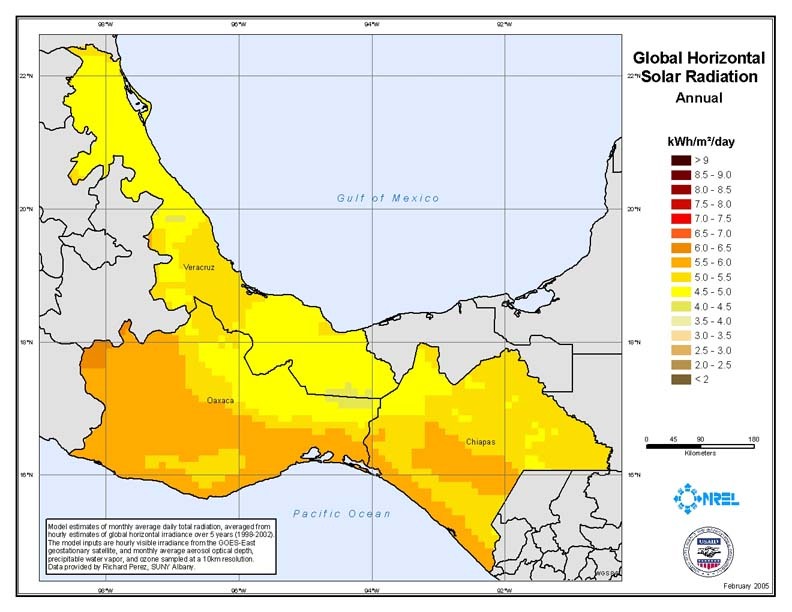 NREL now has posted on its website JPEG versions of maps it made in cooperation with the US Agency for International Development (USAID) for southern Mexico regarding average annual direct normal solar radiation and global horizontal solar radiation.